There’s something to be said for the last of a breed. In the automotive world these are the cars that have usually taken a given model or platform as far as it can go. The positive is that any early bugs or issues should be but a memory by the time the last is built. The down side is that it can make a car feel outdated when compared to the model that replaces it. This particular “last of the breed” Pontiac Grand Ville is listed here on Craigslist. Located in Orlando, Florida, this car comes with a clean title and is priced at $15,500. I must thank our ever vigilant Barn Finds reader Michael who has referred this one to us. When you look at the last iteration of a particular model it is easy to compare it, often unfavorably, with its replacement. This is not such an issue with our feature car. The 1975 Grand Ville Convertible was the end of the line for the name, and represented the last convertible built by Pontiac until 1983. This one appears to be in really nice condition. The panels appear to be straight with consistent panel gaps, and the paint has a nice gloss to it. The seller states that the car has 58,000 miles on the clock, but is unsure whether this is original. He does qualify this by stating that the overall condition of the car leads him to believe that it is. The final year of the Grand Ville was actually referred to as the Grand Ville Brougham. It featured a few items as standard equipment that had previously been optional. These included such things as electric windows and a carpeted trunk. The interior of this particular example presents quite well. None of these photos are particularly good, being quite small, so detail is hard to pick. There may be some discoloration of the carpet and the trim on the door cards, but it is quite hard to be certain. One thing that is interesting is that there does appear to be some over-spray of green paint on the door striker and on a couple of other items in the door shut. Once again this may just be a trick caused by photo quality, but I would certainly like to check that. The seller doesn’t supply any photos of the engine, so we can only guess how things look there. He does state that the engine is the 400ci, which would be correct as the standard engine for 1975 was changed from the 455 to the 400. An auto transmission goes without saying. Standard fare on these included power steering and power front disc brakes. 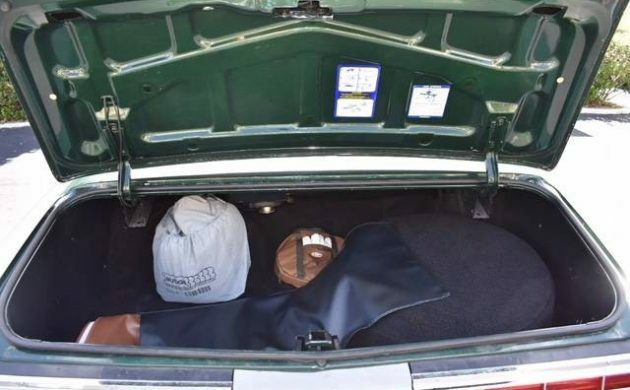 As you can see from this shot the trunk appears to be just as clean as the rest of the car. However, once again the picture quality isn’t great. It’s hard to tell, but there may be some issues around the top edge of the trunk opening, but it could just be an illusion. The 1975 model was the least rare of the Grand Ville models. Pontiac had made it clear that this would be the last year of production, so sales topped out at around 4,500 cars. Logically that fact should ensure that these should be the cheapest of them. However, being the last model can also have a positive impact on prices. Looking around what’s out there at present indicates that the price of this Pontiac is in the ball-park for what you would expect to pay. Having said that, I would want to clarify those possible questions about the paint before I handed over any money. If it is as good as the seller insists, I can picture it cruising along a coast road on a glorious Summer’s day. Since it’s the middle of Winter where I am at present, you have no idea how attractive that sounds to me. All of the convertibles I have had in my life had been the next to last year. I didn’t plan it that way, but it happened. 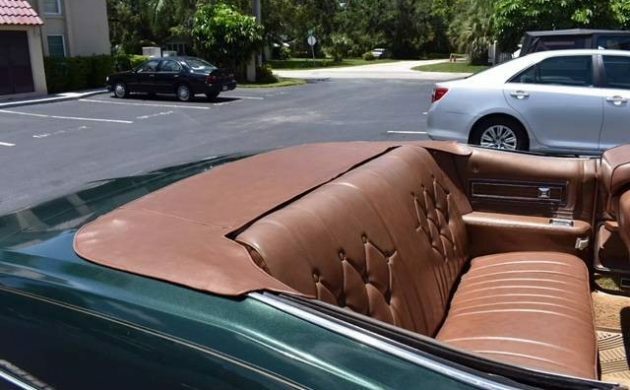 I had a 1974 Olds Delta 88 Convertible. I had a 1971 Ford LTD Convertible. I had a 1969 Mercury Marquis Convertible. I know I am forgetting a few, but that was my lot in life. It seems to me these are the kinds of cars that people can have a lot of fun with. Take a family out for a great weekend with plenty of room to take just about anything you would need. Grab these while you can get them at a decent price as I suspect the prices are going to rise as the drop tops of the popular models are, can I really say it, “going through the roof”. Love me some early disco-era ragtop land yachts. This one looks cruise ready. IF it’s as clean as the pictures suggest, and everything works and runs good, then it’s at the top end of reasonably priced. It may take a while to find someone willing to pay it, though. I have the same car in white, purchased in 1989. Unfortunately mine has a well worn 250,000 miles on it. 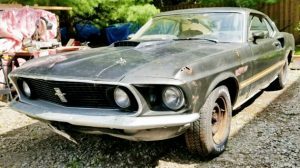 When this hit Craigslist I phoned the owner since I’m only an hour away. The car was in vero beach at the time. It’s a great weekender, and I thought about exchanging my used up ragtop for this, but it doesn’t have AC. That’s a must in FL. I think this is a decent deal and these, along with other “scissors top” GM convertibles will rise as they are currently undervalued. Jim, you can always add one of the new aftermarket a/c systems for classic cars. Although not original, the new systems are far more efficient, lighter, and simpler to install from what I understand. Very good looking car for sure! If I was in the market to buy, I would definitely dicker with this guy and buy the darn thing! Possible over spray is such a minor issue on this one! It looks awesome! I hate the overuse of the word “awesome” but to me, on a big green driver quality 70s Pontiac convertible, it applies. Well this speaks to me, having exclusively owned Pontiacs since I was 16, staring with a ’55 and then every 3 model years up through a 2009. Still have the ’09 Torrent, and just let the ’06 Grand Prix go a few months ago. I never had a Grand Ville though. It supplanted the Bonneville as the top Pontiac from 1971-1975. I had ’70 and ’76 Bonnevilles. My ’73 was a Grand Safari, essentiall the wagon version of the Grand Ville. All were big and smooth; great cruisers. The in & out colors are perfect, pretty sure i’ve never seen them before on a ’70’s big connie. Same with the tuck & button vinyl pattern. We grew up with these monsters…..going to the lake, drive-in movies, firework shows, etc. Mostly Delta 88’s & Caprices, maybe a Buick or two. 350’s & 455’s, pale blue or white or red exteriors & acres of slick white vinyl with monster trunks for all the crap for the pool or picnic. If i had room for one I would definitely jump on this one for $10-12k if it checks out. Nice looking car, but wouldn’t be my first pick out of model years. Back in the mid 80’s, I bought a 72 Grandville convertible from the original owner’s widow. The headlights were round and the Pontiac nose was much more prominent. Came standard with the 455 in the earlier models, and a bit more chrome I believe. That engine was a torque monster! Mine was a lighter green with a white & green interior and a white top. 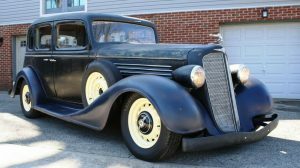 They had purchased it with power everything, a/c, and Pontiac Rallye wheels. Great memories of piling everyone in and going to the drive-ins, and taking the two hour drive to the beach. To me, by 75 they had lost their Pontiac front-facia good looks with a flat grill and square headlights. And the 400 engine just wouldn’t be the same. The rarest are the 71’s, with like only 1700 made. I think Pontiac was having a strike at their factory, or something like that. Someday I want to get another one, and I’d be looking for a 71-72. Great find though, as you just don’t see these all that often! I had purchased a 73 GrandVille Convert. In 1977. Paid $ 1,800 00 for it. Loved that car 455, fender skirts. Maroon matching interior white top. Drove fast and smooth. This one is nice, all but the price. A bit to stuff there. BOP, I have to offer the counterpoint – I think these cars look best with the rectangular headlights. Makes a huge front end a bit more compact and tidy looking. This is an exception for me, because I don’t like the square lights on Caprices, Monte Carlos, Cutlass…etc. I agree, these cars need the 455, and I’m amazed this car doesn’t have a/c…I would have thought that would be standard in ’75? I do agree, when these big beauties had to change to square headlights to comply with federal mandates, the Grandville worked out best looking out of the bunch. I suppose it’s because I owned an earlier one that it’s just wanting to relive the fun. 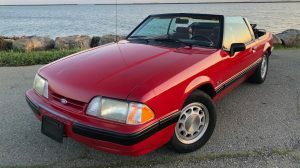 They’re fantastic cruisers, and I wouldn’t say no if offered any of the model years! Remember the “Land Arks” well. My 1st was a 1959 Olds 88 convertible. All were their own brand of fun! 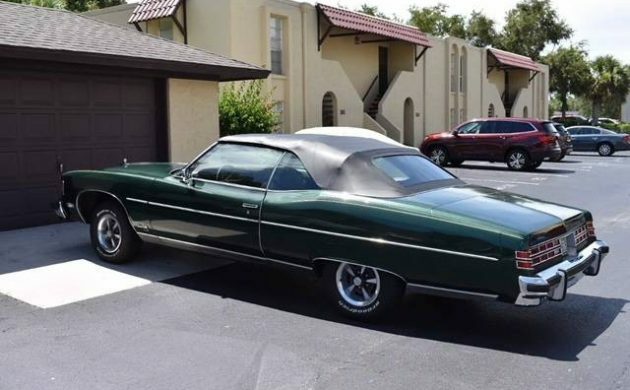 Remember them when they were new….one heck of a good looking ride….and I couldn’t talk bad about a big yacht….I was driving a 1969 SS427 Impala convertible at the time. Beautiful car. I was 20 then, but would have loved one. I’m not sure about that black convertible top though. 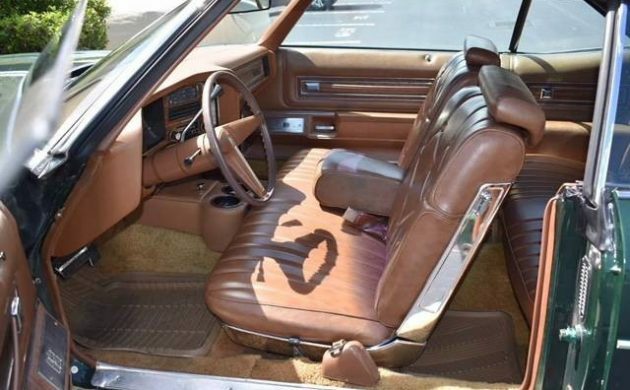 I think the normal top color would have matched the brown interior on this particular color combo. Otherwise, rather cool. 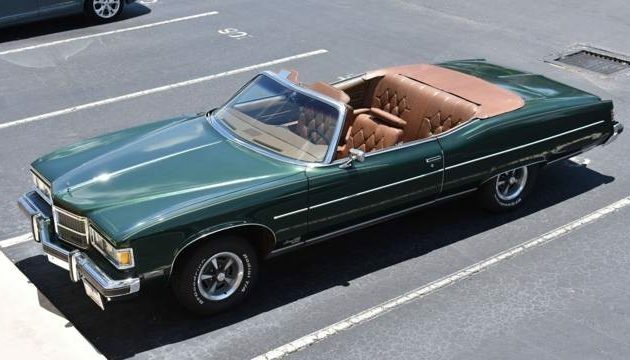 Man do I remember these Granville,s I had a 1972 grandville convertible it was the same color as this beauty featured .It had green interior white top had the 455 4 BL highrise .loved the car it had such style. Paid $1500.00 in 79. Being a Midwest car she had some rust issues. But would flat get it down the hiway she never left me in a bad way I loved that old bird. 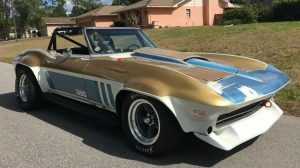 Would love to have another one this 75 is supper fine in my book for the year and what it is cool find wish I could afford to get it them days are over. Growing up on “The Island” with Billy Joel, The Stray Cat’s, and Twisted Sister” I was lucky to see car culture morph from power to soft to power again. After my Military stint I landed in Orlando and watched the “Baby Boomers” retire there with the “Land Yachts” so it is safe to say this Yacht is real. Jump in, its a beauty!!!! Well, if you ever knew or now Know a WWII or later survivor you will understand the mentality of earn your wants and care for them. I am only 53 but look up to the concept of this generation, maintenance allows 400K so mileage is nothing if its cared for, honest.